"I felt on my brush the weight of historical injustice as I depicted the findings of my research. But I also felt the tugging of my brush to depict the fight for justice, which was also there throughout history. There have always been activists, many of them teachers, ready to fight for justice in U.S. public schools. Teachers especially have always been courageous in their resistance to racism and oppression, and I wanted to share this history to inspire others through the images I was painting to take up that truth and join the resistance movement to end institutional racism in public schools." The paintings Susan produced are truly works of art, which have already inspired strong reactions that could quite possibly result in policy makers recognizing the negative impact they are having on the lives of students and teachers in U.S. public schools. But make no mistake this is a book of hope as well as condemnation, which is destined to be studied by teachers and parents who want a re-Visioning of the role of public education in their children's lives, for the emphasis is also on restorative justice and reconciliation. The graphic depictions of the history of racism and discrimination unite the struggles of resistance movements - including Black Lives Matter and the Badass Teachers Association. It is a call for the re-Imagining of public schools as places of racial justice that welcome every child - in a society that recognizes the nation has an ethical responsibility to honor the civil rights of every child and to ensure that each child has the very finest education U.S. public schools can provide. 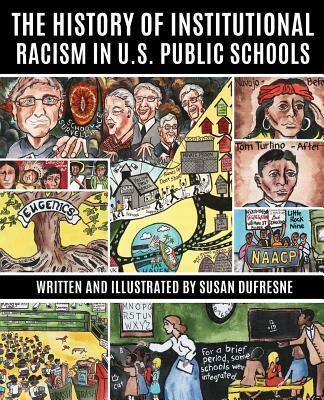 At a time when the Southern Poverty Law Center is raising concerns about the inadequacy of teaching about slavery, both Susan and Garn hope that every teacher and school administrator who has an opportunity to read The History of Institutional Racism in U.S. Public Schools will consider using it as the foundational text in the curriculum on restorative justice and the history of racism in public schools and American society. This book supports the activism of the Badass Teachers Association and the Network for Public Education. The author and Garn Press will donate part of net profits to Black Lives Matter and to the Lakota People's Law Project.